West Bend Winterland, the Claremore Chamber of Commerce, Claremore Merchants Group, and Claremore Main Street have partnered together to make a great Claremore shopping experience! New this year is Claremore’s Holiday Trolley, a complimentary service provided to shoppers looking for a convenient way to get around town! The Holiday Trolley will leave from the grounds of the Claremore Expo Center and make continuous loops to several trolley stops. Shoppers can park at the Expo Center, ride the trolley to Ne-Mar Shopping Center or historic downtown Claremore every Saturday in December, except December 29. 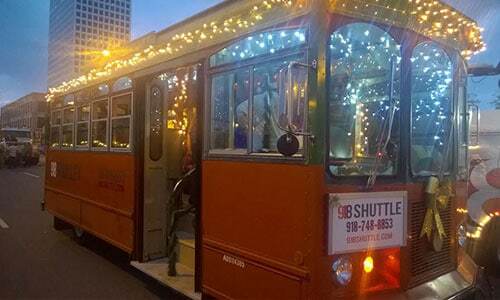 Trolley rides will start at noon and end at 8pm. Many of the merchants in historic downtown will remain open until 7pm or later, and folks can always grab a great meal or libations while they are out and about. “The merchants are excited to participate in West Bend Winterland and are glad to partner in the Holiday Trolley which will provide shoppers a convenience we have not had in Claremore before,” said Sheila Giannelli, president of the Merchants Group. A full schedule of the Holiday Trolley and West Bend Winterland can be found at www.westbendwinterland.com, or call 918-342-5357 for more information. Next articleWin a Michael Kors Bag at Carol’s Place in Claremore!